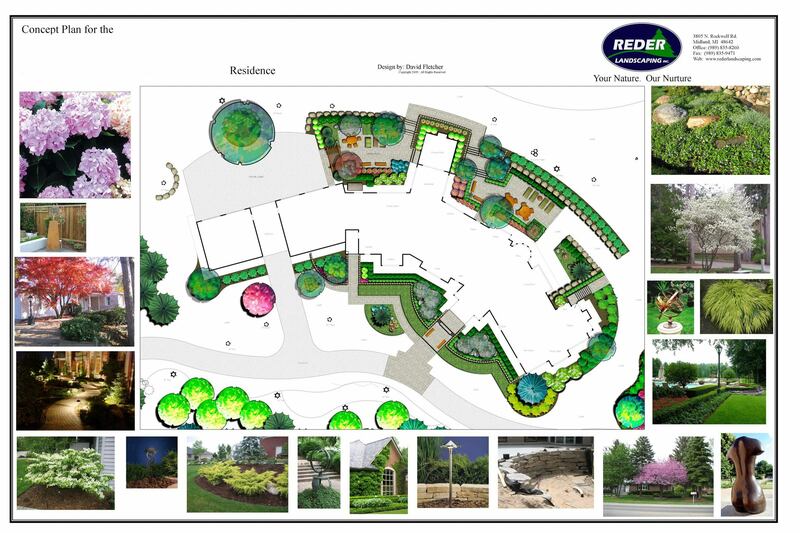 If you can dream it, the award-winning landscape design team at Reder Landscaping can help you bring it to life with insightful advice, creative design solutions, and a commitment to quality and value that has made us the landscape firm of choice in this area for more than 50 years. From Consultation to Concept Designs to Master Plans, our full-time, professional landscape design staff offers a complete line of landscape design services for commercial landscapes and residential landscapes. We can develop and install plans to suit almost any taste or budget, from basic enhancements to resort-level outdoor living spaces that can include a multitude of options. How much should I expect to invest in landscaping for my home? A question often asked of landscape professionals is “How much should I expect to invest in landscaping for my home?” Depending on your site and your goals, as a general rule, somewhere between 5 – 15% of the total construction budget should be allocated for landscaping. This would include all hardscaping (patios, walks, retaining walls and decking) as well as the installation of all trees, planting beds and lawn areas. Naturally this isn’t always feasible after the costly building process. However, if you feel that you’ve invested too much in a beautiful interior to sell yourself short on the space around your home, then phasing may be the ideal solution. Just like it sounds, phasing means developing a master landscape plan at the outset, but then installing it in gradual steps or “phases”. The basics such as walkways, retaining walls, lawn and irrigation can be installed during the first phase as the home is completed, and then subsequent phases installed as budget or other circumstances allow. The key to the process is working from a master plan from the beginning to ensure that each phase will mesh perfectly with those that come before and after. At Reder Landscaping we phase the majority of the new-home landscapes that we install and a good portion of our renovation projects. In fact, renovations can benefit just as much from phasing as new-construction projects. If you’ve always wanted a beautiful landscape, but weren’t sure whether your budget would allow it, then give us a call today. We’ll be happy to discuss in more detail how phasing may benefit your particular project! Today’s consumer has an incredibly wide variety of investments choices…stocks, bonds, mutual funds, annuities, REIT’s… the list goes on and on, Many of these an be great investments, but while it is true that owning shares in a solidly performing mutual fund can provide a quiet sense of satisfaction, it isn’t nearly as much fun as actually sitting in and soaking up the atmosphere in another great investment…a newly renovated landscape. Overhauling an unattractive landscape or simply adding or updating features to an existing landscape offers several important advantages for both your investment portfolio and your quality of life. On the portfolio side, your home is one of the largest investments you’re likely to make during your lifetime and maintaining its value should be a keystone in any financial plan. According to one recent study, a well-designed and well-maintained landscape can increase the value of your property by up to 15%, and Money Magazine and the Wall Street Journal report that a good landscape has an investment recovery rate of between 100-200% at sale time. This compares to 75-125% for kitchen remodeling, 20-120% for bathroom remodeling, and 20-50% for the addition of a swimming pool. Also, according to realtors, a home with an attractive landscape brings more prospective buyers through the front door and may decrease a home’s time on the market by five to six weeks. And finally, it’s important to remember that landscapes continue to increase in value as trees and other plants mature. On the quality-of -life side of the investment ledger it’s difficult to beat the ability, after a stressful day, to relax with your family for dinner on a secluded stone patio, hemmed on one side by loose evergreens and on another by roses in full bloom, swaths of lawn flowing between trees and the cool, shaded beds of foliage that surround them, or the pride that comes with greeting friends at the front door as they stroll through an elegant setting and into a spacious outdoor entry foyer lit softly by hidden fixtures, and complete with a teakwood bench nestled beneath the arching branches of a flowering crabapple surrounded by pools of annual color. A landscape like this that is well-designed and tailored to a family’s desires and lifestyle goes far beyond the all-too-typical role of decorating the foundation of a house. It creates spaces in which families can actually LIVE… patios and decks for relaxing and for dining or entertaining, living screens for privacy, lawn areas for recreation, pools for reflection or bathing, gardens for bird or butterfly-watching or for culinary herbs, contouring and color for year-round drama and interest, and much more. Good landscaping actually increases a home’s usable square footage through the creation of “outdoor rooms”, and if it’s done well they become a natural, flowing extension of the living spaces inside. All of these aspects contribute to an improved quality of life for individuals, couples or entire families, and make landscaping a great investment for more than just financial reasons. By far, though, the single greatest benefit to adding a landscape renovation to your investment portfolio is immediate payoff. Again, it’s comforting to own shares in something that may pay off down the road, but a landscape renovation is a wise investment that you can actually enjoy TODAY and for years to come, and that is still likely to yield financial rewards at sale time. Getting started is easy! Simply give us a call or email us to tell us a little about your project. You’ll find our staff knowledgeable, easy to work with, and enthusiastic about helping you transform your ideas into the landscape you’ve always dreamed of. Whether you’re looking for a free quote for some basic enhancements or for full scale design and construction, the process begins the same way…with a call or a note.